Announcement Keep your belly button ring during pregnancy by wearing a flexible maternity belly button ring from Belly Charms. 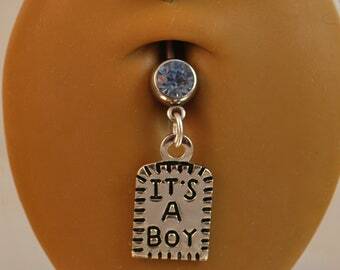 In my shop you will also find regular belly button rings and a few other custom items. 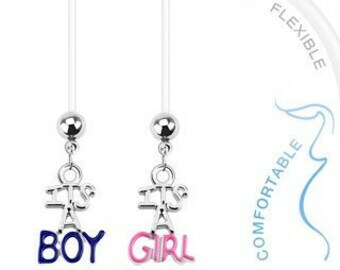 All of the maternity belly button rings are made from flexible 14g PTFE. This is extremely comfortable and can easily be cut to any length for a perfect, custom fit. 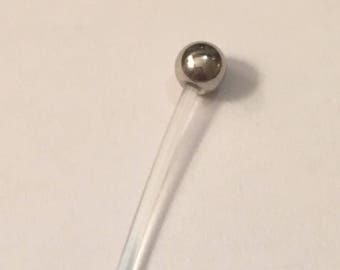 Maternity belly button rings can be cut and fit for a perfect fit and a few lengths are available on most designs. 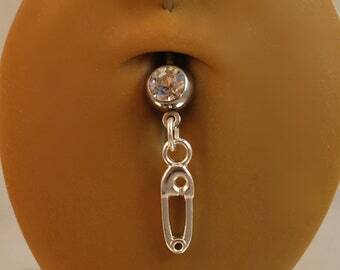 Instructions on how to shorten your belly button ring can also be found on the Belly Charms "SHOP POLICIES" link. My business card, that you get with your order, also has the direct link to sizing info. FAST SHIPPING ON ALL ORDERS! Keep your belly button ring during pregnancy by wearing a flexible maternity belly button ring from Belly Charms. In my shop you will also find regular belly button rings and a few other custom items. Love to product and easy to adjust to fit! My signature item, long and flexible pregnancy belly button rings. I have lots of charms and acrylic balls available. I started Belly Charms the end of 2007, the same year my second son was born. 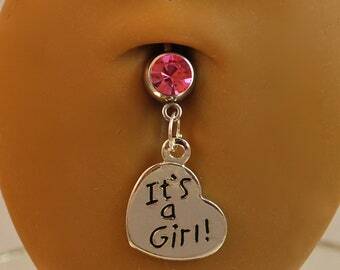 I had to search for days online to find a pregnancy belly button ring. I finally found one and loved it. I did my research and decided to start a business making them. It took a few years, and many sleepless nights with 2 little ones. My pregnancy belly button rings and mothers' bracelets have been seen in Pregnancy & Newborn Magazine, Fit Pregnancy and OK! Celebrity Magazine. I am the WAHM of 2 boys, a fitness professional and a Plexus Ambassador. I started Belly Charms when my youngest was born in 2007. Thank you for visiting Belly Charms. I take pride in the jewelry I create. I offer quality maternity jewelry, personalized mother's bracelets and other custom jewelry at affordable prices. I want to be sure you are 100% happy with your purchase. If for any reason you are unsatisfied, please let me know ASAP so I can fix the situation. All items are shipped by first class mail and ship in the US only. All orders are shipped fast, USPS and normal delivery is 3-5 business days. Need it fast! Priority and Express shipping are available for an additional charge. Just message me for rates. HOW TO SHORTEN AND RETHREAD YOUR FLEXIBLE PTFE BELLY CHARM. 3. When the ball "catches" you are set. 4. Very easy to do.